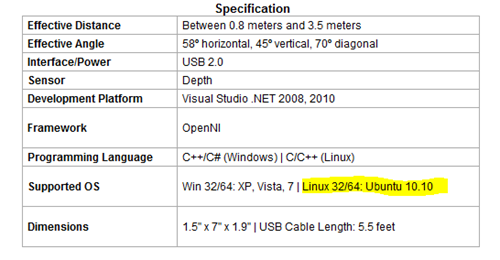 ASUS' kinect competitor 'Xtion PRO' Supports development on Ubuntu - OMG! Ubuntu! But the need for third-party-fudging of Kinect hardware could soon be a thing of the past if the recently-released – and official – development kit of ASUS Corps. PC-based Kinect competitor ‘Wavi Xtion’ is anything to go by, which lists Ubuntu 10.10 as an officially supported development�platform. The result is the dubiously-dubbed ‘Wavi Xtion’ – ‘wavi’ being a set of data-streaming boxes and ‘xtion’ being a gesture-controlled camera. Ahead of the full fleet of ‘Wavi Xtion’ hardware hitting the shelves a nifty developers kit has been released that allows eager coders to begin crafting motion-sensing apps and games in time for the launch of the kit proper later this year. The development kit, called the ‘Xtion Pro and consisting of the ‘camera’, costs $189.00 / �144.00. In the specifications box for the kit Ubuntu 10.10 is listed as a supported development platform. To kick off interest in the hardware a US$20, 000 competition has been launched in which interested developers are invited to submit applications, games or videos which demonstrate the Xtion Pro in use. There was an awesome talk at Linux.conf.au 2011 in Brisbane this year called Use the force, Linus showing off how one can hack the Kinect to fly one of those neat RC helicopter things. Seeing as we don’t get to talk about the Kinect and motion controlling stuff using Linux that much around here, I thought I’d just dump this video in here… Enjoy!